latest 209, Very Large Resource orders pending. 13: Latitude and Longitude: Lat: 34° 15´ 4" Long: 118° 11´ 41"
12 hours: South toward the Cities of LaCanda-Flintridge, La Crescenta, Pasadena and Glendale. West toward the Yerba Buena Ridge. North toward the 14 Freeway and the Santa Clara Ridge. East toward Mt Disappointment and Mt. Wilson. 24 hours: South toward the Cities of LaCanda-Flintridge, La Crescenta, Pasadena and Glendale. West toward the Yerba Buena Ridge. North toward the 14 Freeway and the Santa Clara Ridge. East toward Mt Disappointment and Mt. Wilson. 12 hours: Northern portions of the Foothill Communities of La Canada-Flintridge, Altadena, Glendale, Pasadena and Sunland-Tujunga. Mount Lukens Communications Facility, Edison 220 Kv Powerlines, Edison 33Kv Powerlines to Mt. Wilson, Gould Sub-station, NASA Jet Propulsion Laboratory, Arroyo Seco Residences, ANF Clear Creek Fire Station, Clear Creek School, Red Box and Mt Disappointment communication sites and the Mount Wilson Communications Facility/Observatory. 24 hours: Northern portions of the Foothill Communities of La Canada-Flintridge, Altadena, Glendale, Pasadena,and Sunland-Tujunga. Mount Lukens Communications Facility, Edison 220 Kv Powerlines, Edison 33Kv Powerlines to Mt. Wilson, Gould Sub-station, NASA Jet Propulsion Laboratory, Arroyo Seco Residences, ANF Clear Creek Fire Station, Clear Creek School, Red Box and Mt Disappointment communication sites and the Mount Wilson Communications Facility/Observatory. 12 hours: S/T Type I Crews (5), Type I Crews (15), S/T Type III ENG (10), DIVS (12), Type II WT (5), Type II Crews, OPBD (8), Dozers (20), DOZB (20), LSC1 (1), PIO any type 15. Red Flag Warning for very high temperatures and low relative humidity remains in effect. The fire area is extremely steep and inaccessible. The fire is burning in burning in 40+ year old 15 to 20 foot high decadent vegetation. Fire is active during the day and night operational periods. The fire is currently making runs toward Mount Wilson, which is a major communications facility servicing all of Southern California. Extreme fire behavior observed including plume dominated fire behavior, spotting and major runs. The fire quadrupled in size driven by SE winds. Major fire activity drove the fire north across Big Tujunga Rd and west over Mt. Lukens. The SW portion of the fire extended causing new mandatory evacuations in the Foothill Communities of Altadena, LaCanada-Flintridge, LaCresenta and Glendale. 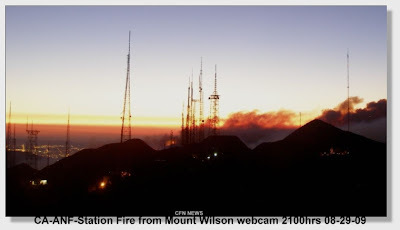 The fire is now threatening the Mount Wilson Communications Facilities and Observatory. Unified Command was expanded to include Glendale and Pasadena. Triage, prepare, and protect structures when and where necessary. Construct handlines and dozer lines. Protect critical communication sites. Current Strategy will succeed only if critical resource needs are met and the current weather conditions improve. 42: Remarks: Angeles Crest Highway remains closed and is the primary access route for 18+ Camps/residences , numerous private residences, and the Mount Wilson Communication Facility and Observatory. Multiple evacuation centers have been established. The Mount Wilson Communications is now a major concern. This facility is a major communications hub for all of Southern California. 3 civilian injuries were reported today. A spike camp will be established in Santa Clarita.